Estate Jewelry is jewelry that has been previously owned. The general rule of thumb is that if a piece is over 100 years it can then be classified as Antique Jewelry. The jewelry is unique in that technique, materials, workmanship, all have changed or sometimes , become cost prohibitive to reproduce in today’s society. The jewelry is also, like styles, furniture or fashion related to definite periods styles. Generally the following periods create the differences in the styles. Whether you are a curious owner or a serious collector, Wm H Diller Jewelers has a ever-changing collection of Estate pieces. Almost everyone is curious about old jewelry, maybe it’s because most people have a piece or two tucked away. You can receive it as a gift for a special occasion or a self purchase, however you treat your Estate pieces with proper care they will be heirlooms for future generations. Most people ask how we come by the jewelry. Many sources are the answer . 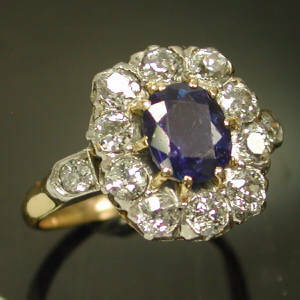 Estate settlements, individuals, auctions, antique shows or even flea markets are some of the ways we find the jewelry. Check to be sure that all stones are secure before cleaning. Clean only one piece at a time to avoid scratching, allow professionals to clean anything that has foil backed stones. Always store each piece separately. A homemade solution of one cup warm water, two tablespoons of dishwashing liquid, and one teaspoon of clear ammonia works well on diamonds and hard stones. Pearls should be wiped with a soft cloth. Perfume and hair sprays can damage the natural nacre on the pearls and should be avoided. A salt water solution followed by mineral oil works well. If worn often they should be restrung yearly and always be knotted. Gold and silver- If the jewelry is karat gold and free of stones commercial cleaners are fine , however filigree should be handled with more care.